Her name is Donna, and she was the pride of the city of DeKalb. She replaced a huge honor-roll board and a World War I German siege gun, which was disassembled to be used in the war effort in 1942. She arrived in 1949 by railroad, resting at the city garage until an appropriate dedication ceremony could be planned. Donna is a 28,500-pound STUART M5 tank that was used as a memorial to honor those who had served their country. Her resting place for many years was at the corner of Lincoln Highway and Fourth Street along the railroad tracks. She was secured through the Army and was shipped from Watervleit, New York. A concrete base was poured at the memorial site for Donna to rest her weary treads. Treads that were once manufactured in DeKalb at the Northern Illinois Corporation defense plant, in the former steel company Red Shop, at 435 East Locust Street. In October of 1949, the base had cured and was ready for Donna. The dedication ceremony was held on Nov. 6, 1949. The men of the American Legion and Veterans of Foreign Wars participated in the event, which also included placing a bronze plaque and a flag pole at the dedication. 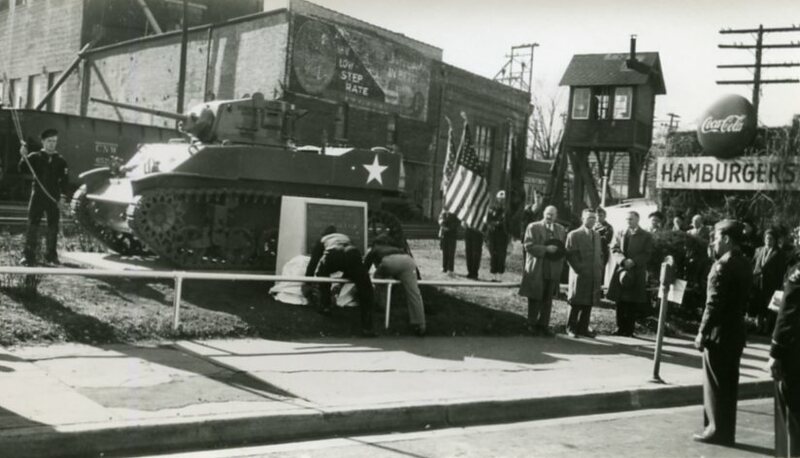 Donna, a 28,500-pound STUART M5 tank, is shown at her dedication in November 1949 at the corner of Lincoln Highway and Fourth Street, DeKalb. Donna has had an interesting stay in DeKalb. On Aug. 4, 1961, DeKalb experienced a train derailment at Lincoln Highway and Fourth Street. Donna was struck by a train car and moved out onto the highway, where she demolished a brand-new car. Then in 1967, a group protesting the Vietnam War defaced Donna with yellow paint. 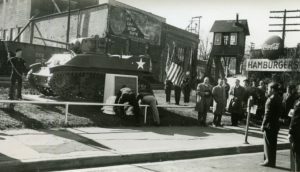 More humiliation came in 1980 when it was decided to move the old Army tank and old downtown clock to a less conspicuous location, as the memorial to our fallen soldiers had become an “eye sore” to some city officials. It took until 2002 before a location was established. Memorial Park, at the corner of Lincoln Highway and First Street, was chosen as the new resting place for Donna, where she has been ever since to honor those who died in defense of freedom. 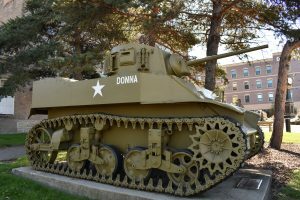 Donna now rests at Memorial Park, Lincoln Highway and First Street, DeKalb, to honor those who served our country. Who was Donna? It was tradition to name a tank after the tank commander’s wife, girlfriend, or mother. Donna’s real name was found when sandblasting off old paint in preparation to repaint her. Wife, girlfriend, or mother, we don’t know; but we do know she proudly stands for the freedom we all enjoy today.